I have a tendency to go overboard. And food blogging only exaggerates it. For example. That one time. Did I really need to add the grated apple, caramelized onions, butternut squash sauce, and crumbled bacon to what started as a simple mac and cheese? Actually, yes. That was a bad example. But my over-zealous inner food blogger loves adding extra, sometimes unnecessary, and dare I even say distracting? ingredients to recipes that should be left alone. Simple. Un-messed with. Like homemade brownie batter with a spoon and a glass of milk: basic and perfect. 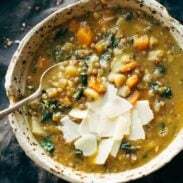 In way too recent memory, Ginger Coconut Jalapeno Sweet Potato Cabbage Lentils almost became a real recipe name on this blog. Delicious and yet another example of overboard. Instead I named it Creamy Thai Sweet Potatoes and Lentils, because I have a bad habit of naming any recipe with curry paste and coconut milk in it “Thai”, and it’s totally yum. But it was almost annoying. One thing I’ve really tried hard to do as a food blogger is KEEP THE FOOD SIMPLE. As in buttered noodles simple. Part of my Pinch of Yum “job”, whatever that means, is creating recipes that are fun and unique and different and inspiring to all you lovely friends who read my blog, and I truly LOVE FOOD, all the delicious food across the whole wide Earth, so experimenting with new ingredients is reallyreally fun for me. At the same time, simple and familiar is really my favorite. Basic dishes with fresh ingredients that people feel comfortable making? I feel so good when that is what comes across through this little internet space. This garlic butter spaghetti is that, in a nutshell. How good does that smell? It’s like this. –> Butter (I splurged on the expensive stuff, which still isn’t as good as my favorite Market Pantry butter at home, but it’s butter and it’s delicious) bubbling on the stove with a pile of minced garlic and chopped fresh greens. Soft, sticky, carby whole wheat noodles boiling extra long in the pot because al dente isn’t going to cut it for this one. My tiny apartment smelling heavenly. Sea salt sticking to my fingers. My plate heaping with noodles. More butter. More herbs. Searching the fridge for Parmesan cheese. My fork winding its way through a pile of noodles. Basics like this are why I love food. And I mean Love. Food. 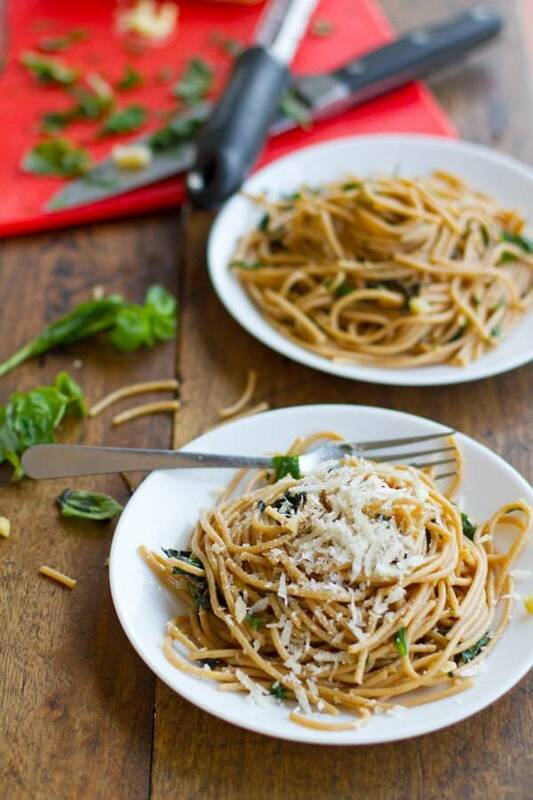 This garlic butter spaghetti with herbs is a simple twist on the traditional. 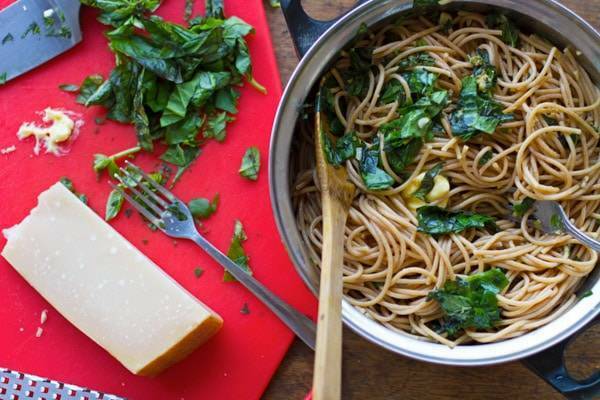 Made with a garlic butter sauce, fresh basil and spinach, and Parmesan cheese. Cook the spaghetti according to package directions. Meanwhile, heat the butter together in a large nonstick skillet over medium low heat. Add the minced garlic and saute for 3-5 minutes, until soft and fragrant. Be careful not to burn or over-brown the garlic because it will taste bitter. Low and slow is the winner here. Chop the spinach and basil (I had about 5 cups total – it reduces quite a bit as it wilts) into small bite-sized pieces and add to the skillet, stirring for just a minute or two to get the greens softened slightly. Season with salt. Add the spaghetti to the skillet (or vice versa depending on pan size) and season with salt and pepper. Toss well to combine and let it all rest for a few minutes to stick together a bit. Serve with an additional pat of butter and/or fresh grated Parmigiano Reggiano cheese. For the leftovers, I added a can of roughly chopped fire-roasted whole tomatoes and about 1/2 cup of vegetable broth and simmered for an additional 10 minutes. The noodles were thick and saucy and loaded with vegetables. So good! Q: Do I recommend eating the leftover noodles straight out’the fridge after a long day at work? A: Have you been spying on me? I don’t mind over the top, and I definitely don’t mind simple! This sounds amazing!! I really really really want a huge plateful of this right this very minute. No complaints for simple recipes here! Simple is our go-to on weeknights when we get home from work, but it’s easy to get stuck in a rut and have the same things over and over. So thank you for giving us a fresh, simple idea! while I LOVE complex layers of flavor (which can be achieved with short ingredient lists! ), I also love the simple… this to me is childhood, I loved spinach in my (Buttered) spaghetti, but notsomuch the sauce. I want this right now. With the frigid temps here in KY, I was just day dreaming of walking out to my herb garden and plucking a handful of nature’s bounty to whip something up for dinner. But alas, I’m stuck with the dried variety ): Your “plain” noodles have my mouth watering – even at 9am! Sometimes all I crave is buttered noodles… but all the extras you just mixed in here are pretty genius! This looks like just about the most comforting dinner ever! Thanks for sharing. Buttered noodles, definitely one of my go to favorites! And I totally had a mac and cheese incident the other night…three types of cheese, polish sausage, caramelized onions, garlic, mushrooms, steamed peas, chopped basil, topped with parmesan cheese and Sriracha hot sauce. It was all necessary. Hahahaha! That’s me. Ov-er-board. 🙂 Sounds great though! Ooooh la la! This simple dish just looks so delicious and FRESH! Gorgeous photos, as always! 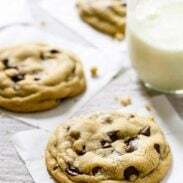 This looks delicious and simple to make. I am always looking for easy weeknight recipes and pasta is a sure bet! Stop stop stop. Now I’m craving butter & garlic at 8:04 in the morning! I love the idea of cooking garlic in butter. That sounds heavenly! Sounds almost exactly like a family favorite except substitute broccoli for spinach and toss in a bit of crushed red pepper. Never thought to try it with spinach. That sounds really good! overboard? Yeah that’s me too. 🙂 But I don’t mind something simple and easy every now and then and this is how I will take it. A big big big plate of this please. Especially after the long chilly hike I plan to take with our pup this weekend, I know I’ll want something like this to replenish and warm me up! My favorite way to eat spaghetti! Butter and parma. That is all. Looks so good! After seeing that picture of butter and garlic, I’m thinking simple sounds pretty good today. I can’t see. I love this. Please keep going overboard and creating such yummy recipes. I will keep coming back, drooling and cooking. :P.
I love the basics. I love pasta. and butter. and garlic. and cheese. This definitely is my kind of meal..and its quick! One of my favorite parts! 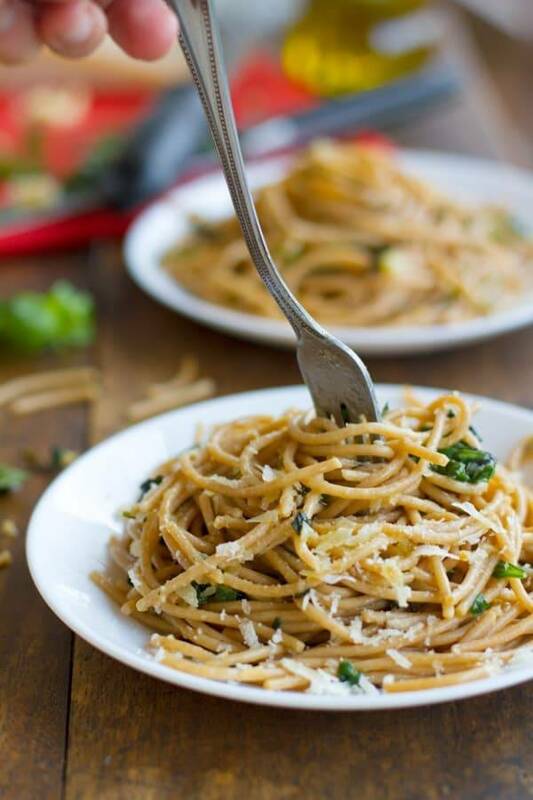 Mmmmm buttery garlicky noodles…I’ve got my fork ready! I love simple so no complaints here!